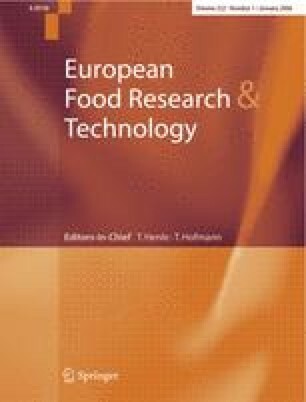 A non-conventional sensitive and specific method for the detection of Saccharomyces cerevisiae in food is proposed. Polymerase chain reaction (PCR) led to the identification of this yeast in some commercial bakery products. The comparative use of two methods of clean-up of DNA from Triticum spp., S. cerevisiae and some foods shows an improvement in extraction yield for the phenol-free method. Analysis of some sequences of ribosomal genes shows different amplified products for Triticum and S. cerevisiae. Internal transcribed spacer amplification (ITS1/ITS4) produced a single band of about 650 and 800 bp for Triticum and S. cerevisiae, respectively. ITS1/ITS2 universal fungal primers gave a single band of about 300 and 450 bp for Triticum and S. cerevisiae, respectively. Both amplification products are able to distinguish between the yeast and the DNA from T. aestivum and T. durum, showing polymorphism in the ITS1 region. Amplification on two primers designed using the sequence of the ITS1 region of S. cerevisiae rDNA (SC1/SC2) led to a single band of 300 bp, species-specific for the yeast. These primers enabled an unambiguous distinction between fermented foods containing S. cerevisiae and those leavened by baking powders to be made. We suggest that this PCR assay could be used for quality control and for the trace detection of S. cerevisiae as a potential food allergen. Key words Polymerase chain reaction Ribosomal DNA internal transcribed spacers Identification Saccharomyces cerevisiae Triticum spp.